Switch up your fry dip selections with these eight excellent sauces. Los Angeles burger lovers agree: The one at Father’s Office is incredible. No controversy there. But there is when it comes to chef-owner Sang Yoon’s long-standing no-ketchup policy. Instead of using everyone’s favorite tomato-based go-to, Yoon tops his amazing cheeseburger with a caramelized onion and bacon compote and serves his fries with aioli. Though the rule has distressed some Angelenos for years, the ketchup ban recently inspired a photographic protest on Yelp. One Yelper posted a picture of a basket of sweet potato fries covered in ketchup and ketchup packets on the Father’s Office page, and is imploring other ketchup loving Yelpers to up-vote it to the point where it will automatically become the restaurant’s primary image. We at Food & Wine support both Yoon’s right to ban condiments and fry-eaters’ right to want it. But we suggest that both parties switch up their fry dip selections with these eight excellent sauces. 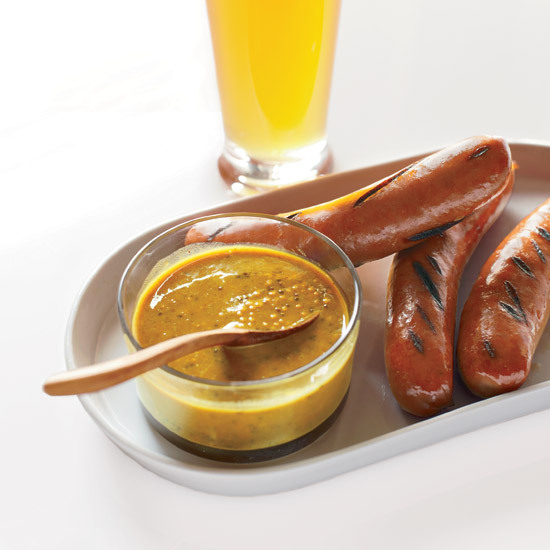 Rich, dark beer is the key to this intense mustard. This healthful, creamy dip is made from Greek yogurt, fresh garlic and cayenne for a little spice. Rick Bayless’s quick recipe for rich queso dip is just the thing to satisfy a sudden craving for something warm, cheesy, salty and gooey. A cross between A.1. and Lea & Perrins. Creamy and lemony with roasted bell peppers and cornichons, this sauce is deliciously sweet and salty. This spicy, citrusy mayo takes just 10 minutes to make. Espresso gives this sauce a deeply rich and complex flavor. This recipe begins with a bowl of creamy ranch dip: Just spoon half of it into another bowl and doctor it with cooked tomato pasta and harissa.